The Lifestyle File: When Your Bananas Look Like This....Eat Them! When Your Bananas Look Like This....Eat Them! For many years, the Japanese have been touted as the healthiest population on the planet. To what can they credit that fact? Consuming large amounts of choice fish, steamed rice, seaweed, tofu and green tea. Well apparently we can also add brown spotty bananas to the list. A lot of us buy our bananas before they are ripe when they are still a little green in the hopes that they will ripen over the week in our fruit bowls and be ready to eat. If you miss the boat on that perfect mid-yellow banana, it's actually a good thing. I know lots of us are conditioned to only want to eat those perfect yellow bananas. 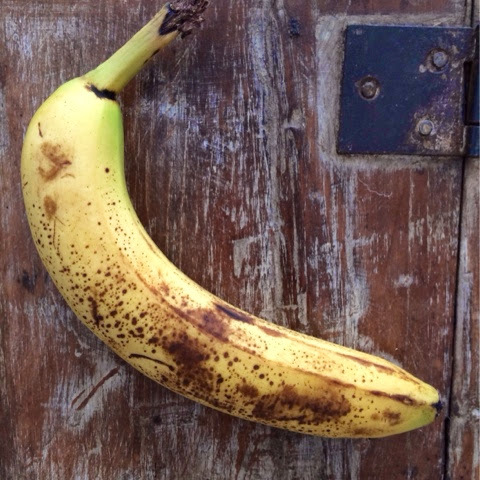 But- if your banana is extra ripe and covered in brown spots- it's a good thing. First of all, these bananas are sweeter than the average fruit. Next, bananas are one of the top-ten foods known to boost your mood. So in other words, bananas have the ability to make us happier. But why brown bananas specifically? According to a Japanese research study, a fully ripe banana with brown spots on yellow skin produces a substance called TNF - Tumor Necrosis Factor which has the ability to combat abnormal cells. The more dark patches a banana has, the higher its immunity-enhancing ability. So the more dark patches a banana has, the better the anti-cancer factor and the better it is for you. Bananas also contain antioxidants. These little guys combat free radicals- the molecules that enter our bodies and cause the formation of cancerous cells. foods with antioxidants combat this abnormal cell growth and prevent disease before it happens. This is why everyone's always saying to eat more antioxidant rich foods. (I'll do a separate post about this soon). A 7 inch banana has about 105 calories (not too shabby for something that can curb your sugar cravings) and counts as one serving of fruit. But keep in mind, the sugar content in a banana will increase as it ripens. This is what makes super ripe bananas great for baking and smoothies. So...don't throw out your brown bananas, in fact, wait until they are at least a little spotty before consuming. If they are totally black reserve them for baking. Although in Japan, that's what they'd give you if you were under the weather as it's full of immunity boosting agents. Who knew?